BROADALBIN – When the Broadalbin-Perth Lady Patriots burst out to a 7-0 lead just two minutes into the game, Johnstown girls varsity basketball coach Tim Derwin thought he was looking at a long night for the Lady Bills. Instead, the Lady Bills turned up their defense and surged ahead in the third quarter to take home their third-straight victory, 41-30 over the Lady Patriots in Foothills Council action Monday at Broadalbin-Perth High School. Makenzie Smith got things rolling for Broadalbin-Perth, drawing a foul and converting on one-of-two free throws just five seconds into the game. She made her second trip to the free-throw line 38 seconds later and made both free throws for a 3-0 advantage. Smith continued her early dominance under the basket, pouring to two baskets in the low post to stake the Lady Patriots to a 7-0 lead two minutes into the game. The Lady Bills adjusted defensively and were successful in shutting off the Lady Patriots inside game, but could not put any points on the scoreboard until Anna Lee connected on a 3-pointer with 2:52 left in the opening quarter. Lee added a free throw and Jess VanNostrand converted on a pair of free throw for Johnstown to cut B-P;s lead to 7-6 before Nyah Thompson hit her first basket of the night in the closing seconds and Kanako Sasaki answered for Johnstown to close out the opening quarter with the Lady Patriots holding on to a 9-8 lead. Johnstown took its first lead of the game 45 seconds into the second quarter on a put back from Amber Tesi before the lady Patriots went on a 6-0 run to build a 15-10 lead with 2:05 left in the opening half. The Lady Bills answered with a 5-1 run over the final minute to cut Broadalbin-Perth’s halftime advantage to a single point, 16-15. The Lady Bills opened the second half with an 8-0 run with Lee accounting for six of those points and Abbygail VandeWalker the other two, to take a 23-16 lead. Smith began finding success in the low post, drawing fouls and earning trips to the free-throw line where she converted on 3-of-6 opportunities. The Lady Bills also earned trips to the free throw line and converted on 7-of-10 chances as neither team made a field goal in the final four minutes of the third quarter. With a 30-21 advantage going into the fourth quarter, the Lady Bills began working the ball deep into the shot clock before putting up an attempt to close out the 41-30 league win. Lee led the Johnstown scoring with 14 points, while VanNostrand had nine and Tesi finished with six points and 10 rebounds. Jaden Wilson finished with five points, while Sasaki had four and VandeWalker rounded out the Lady Bills scoring with three points. Smith finished the night with a double-double of 16 points and 11 rebounds while Thompson had six points, Lola DiCaterino had five and Kylie Stigberg chipped in with four. Johnstown (6-10 overall, 4-10 Foothills) returns to action Thursday night at Warren Street Elementary School when it looks to avenge an overtime loss to Schuylerville. The Lady Bills will host Gloversville next Monday on Senior Night at Fulton-Montgomery Community College. Broadalbin-Perth (4-12 overall, 3-11 Foothills) will travel to play Queensbury Thursday. Sasaki 1-2-4, VanNostrand 1-7-9, VandeWalker 1-1-3, Tesi 3-0-6, Lee 5-2-14, Wilson 2-1-5. Totals: 13-13-41. Stigberg 1-0-2, DiCaterino 1-3-5, Thompson 3-0-6, Smith 5-6-16. Totals: 10-10-30. 3-point goals: Johnstown 2 (Anna Lee 2); Broadalbin-Perth none. 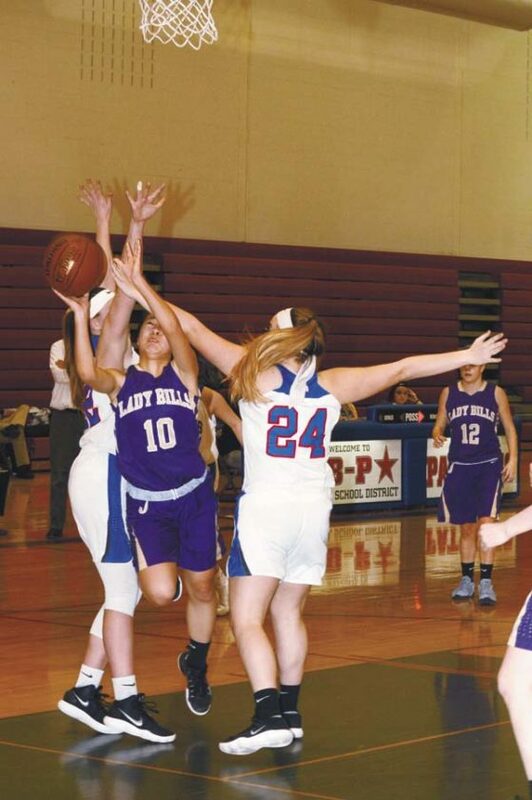 SCHUYLERVILLE — The Lady Dragons extended their Foothills Council win streak to 10 games with Monday’s victory over Schuylerville. Harmony Philo led Gloversville with her 20-point performance that included four 3-pointers. Kerri Hauser finished with 17 points, while Alex Benfatti had 14 points and Kendra Lavery chipped in with 10. Cassie Patrick led the Black Horses with 14 points, while Emily Vallee added eight points. Hauser 6-5-17, Philo 7-2-20, Langley 3-0-7, Benfatti 4-5-14, Lavery 5-0-10, Jones 1-6-8, Christman 1-0-2, Brown 0-3-3. Totals: 27-21-81. Vallee 4-0-8, Patrick 4-5-14, McShane 2-0-4, Signor 1-0-2, Spencer 1-0-3, Hough 2-0-5, Phillips 1-0-2, Haviland 2-0-4, Darrah 0-2-2, Totals: 17-7-44. GLENS FALLS — Giuliana Pritchard led the Lady Rams to their second-straight win with a 25-point performance Monday at Glens Falls High School. Elena Fedullo chipped in with 13 points for Amsterdam while Jackie Stanavich finished with eight points. Anna Bayle led Glens Falls with 25 points and six rebounds, while Sovereign Strickland finished with 13 points and Felicity Williams had seven assists on the night. Stanavich 4-0-8, Livero 1-1-3, May 1-0-3, Pritchard 9-6-25, Beekman 2-0-4, Fedullo 3-7-13. Totals: 20-14-56. Schliff 1-0-2, Bayle 8-6-25, Cutter 4-0-12, Williams 1-0-2, Strickland 5-1-13. Totals: 19-7-54. 3-point goals: Amsterdam 2 (Antonia May, Giuliana Pritchard); Glens Falls 9 (Lexi Cutter 4, Anna Bayle 3, Sovereign Strickland 2). HUDSON FALLS — League-leading Scotia-Glenville got a 15-point performance from Mary Kate Palleschi as the Lady Tartans held off Hudson Falls for the win. Rhaymi Porter joined Palleschi in double-figures with 10 points. Brinley Inglee led Hudson Falls with 16 points. Mitchell 2-4-8, L. Geniti 2-0-4, J. Geniti 1-0-2, Palleschi 6-2-15, Winney 3-0-8, Porter 3-4-10. Totals: 17-10-47. Phillips 2-0-6, McCarthy 1-1-3, Kelley 3-0-6, Kitchner 2-0-5, Inglee 6-1-16, DePalo 1-4-6. Totals: 15-6-42. SOUTH GLENS FALLS — Hope Sullivan connected for 26 points and Hailey Ballard finished with 18 to lead Queensbury to victory over the Bulldogs. Hannah Breen and Makenzie Collier led South High with 16 points apiece. O’Connor 4-0-8, Ballard 7-4-18, K. Hunt 2-0-4, Doin 2-0-5, Sullivan 10-2-26. Totals: 25-6-61. Breen 5-2-16, Buser 0-2-2, Collier 5-4-16, Hart 2-0-5, Lanfear 1-0-2, Bovair 0-2-2, Shaw 3-1-7. Totals: 16-11-50. MAYFIELD — The Lady Panthers held Mekeel Christian to a single point in the first quarter but could not build off the success as the Lions charged to outscore Mayfield 23-14 in the second half to pick up the victory. Elizabeth Singleton led Mekeel Christian with her 20-point effort, while Rebekkah Dean finished with eight points. Sydney Sheldon paced the Lady Panthers with 19 points, while Camryn Meca had seven and Kaylee Hampton chipped in with five. Davis 1-0-2, Dean 2-4-8, Show 2-1-6, Ballard 1-2-4, Delarosa 1-0-3, Singleton 8-3-20. Totals: 15-10-43. L. Hampton 1-2-4, Meca 2-1-7, Sheldon 6-7-19, K. Hampton 2-0-5, LaGrange 1-0-2. Totals: 12-10-37. 3-point goals: Mekeel Christian Academy 3 (Madison Show, Altagracia Delarosa, Elizabeth Singleton); Mayfield 3 (Camryn Meca 3, Kaylee Hampton). BERNE — The Bulldogs received scoring from 11 players in their victory over Oppenheim-Ephratah/St. Johnsville Monday. Taylor Meacham led BKW with 14 points, while Morgan Thomas finished with 13 and Amber Skinner had eight. Shian Harman and Rebecca Trumble led the Lady Wolves with six points apiece, while Alexis Klock had five. Harman 2-2-6, Hart 0-1-1, Klock 1-4-5, LaCoppola 0-2-2, Richardson 1-2-3, Trumble 3-0-6. Totals: 7-9-23. Bianchi 1-0-3, DiRoma 1-0-3, Latham 1-0-2, Meacham 6-0-14, Morrow 0-1-1, Ruiz 1-2-4, Sherwin 2-1-5, Skinner 4-0-8, Thomas 0-1-1, Wright 6-1-13, Yarusso 1-0-2. Totals: 23-6-56.